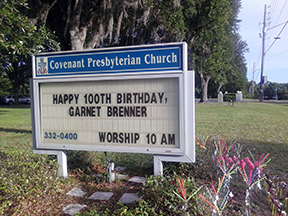 Last May 17th, we had a very special worship service and fellowship time as we celebrated our own Garnet Brenner’s 100th Birthday! Garnet’s family “took over” the service with her daughter, Janis Bomar, acting as liturgist, her son, Bart Brenner, giving the message, and her other son, Gary Brenner, leading the tree dedication. Along with Gary was his wife, Diane. Also in attendance was family friend, Brenda Dye. 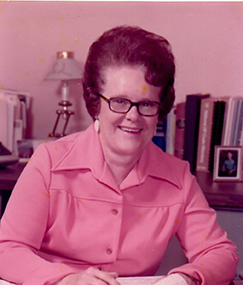 After the service and tree dedication, the congregation adjourned to the Fellowship Hall for a taco lunch, birthday cake, and memories and stories about Garnet. Happy 100th Garnet! 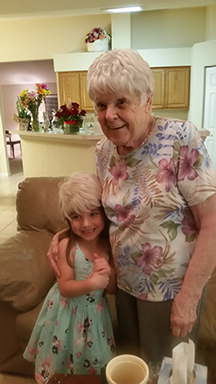 Garnet with one of her Great Granddaughter, Avene (looking a lot like Garnet, here). 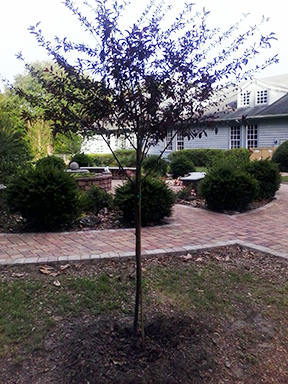 Tree planted beside Covenant’s Memorial Garden and dedicated in honor of Garnet. ← Covenant invites you to come and worship with us!